Dear First Name…..you’ve had an email like that, I am sure. Some hapless email marketer fails to enter the right data and you end up being called “First Name” or some such bland tag. The trouble for most internet marketers is that they haven’t got much to go on. Often, all they collect is your name and your email address. The only thing they can use to make any emails personal is your name. However, even though we all love being called by our own name, it turns out that it is not perceived as “personal”. The fact is, we expect to be called by our own name when someone is writing to us. So it isn’t “personalisation”. Indeed, new research shows that in terms of return on investment using a person’s first name is towards the bottom of the list of effectiveness. Indeed, the research shows that using someone’s name is the most popular method of personalisation, but it is one of the least effective methods of achieving a return. Much better at gaining business is using purchase history or personal preferences. In other words, you make more money out of deeply personalising than you do if you are merely superficial. What this research implies is that you have to collect more data about your website visitors and then use it to provide them with something that is centred upon their personal interests. Amazon is a great example of this. Log in and what you see will be different to every other person who has logged in. Amazon uses your behaviour, your purchase history, your wishlists and other expressions of interest to deliver something much more personal than merely saying “Hello First Name”. It all points to the need to collect more data about people other than just their name. However, if you are collecting information using an online form, the more fields you have the less likely people are to fill it in. So you need to be able to collect information in other ways. Alternatively, you can narrow your niche so tightly that everything you provide is already deeply personalised to a subset of people sharing the same interests. Frankly, this is the easiest way to go for many businesses. Plus it has search engine benefits too. For instance, if you provide accountancy services to small businesses a website describing what you do is of general interest but not personalised enough to attract people. But what if you have a website for accountancy services for independent florists? That is much more personalised to their needs. Those florists won’t even care that you have a pretty similar site on accountancy services for independent shoe shops, or another for independent funeral directors. For many businesses the niche route is going to be the easiest and the most cost effective. 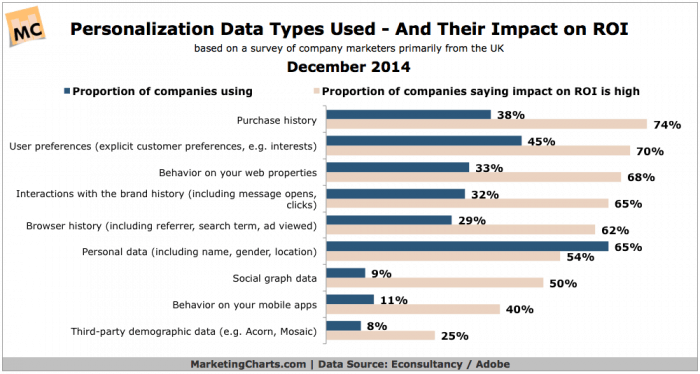 What this new research shows, however, is that you cannot ignore the personalisation route. The more you make what you deliver focused on the precise interests of your visitors and email recipients, the more you will get a return. Power of personalisation appears to be a myth Personalisation makes almost no difference to whether or not your marketing succeeds. New study findings. Is communication getting too complex for brands? Different categories of customers prefer alternative methods of communication. There is a complex array of methods of communicating required by brands.